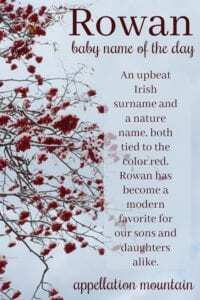 Rowan counts as a nature name and an upbeat Irish surname choice, too. Thanks to Kelly for suggesting our Baby Name of the Day. Like Riley and Kennedy, this one has a long history of use as an Irish surname. The original would’ve been something like Ó Ruadháin, from ruadh – red. The given name Ruadán dates back centuries, too. 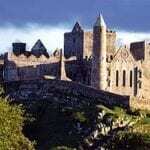 There’s a Saint Ruadán from the 500s, one of the twelve apostles of Ireland. A minor mythological figure answered to the name, too. It often became Rooney in English, but Rowan also evolved from Ruadán. During the nineteenth century, Archibald Hamilton Rowan inherited beaucoup bucks but ended up a radical anyhow, advocating for Irish liberty and the rights of the poor, in a dramatic fashion. He once wielded a shillelagh in a Dublin dining club to make a point. A New Jersey engineer-turned-philanthropist has a university named in his honor. There’s also a Civil War admiral who served the Union Navy. His career spanned 63 years, one of the longest on record. Many Americans first heard this as a given name thanks to British comedian Rowan Atkinson, who rose to fame as the bumbling, mostly silent Mr. Bean. He’s had a long career, beginning in the late 1970s. 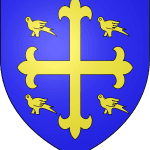 It appears to have more history as a first name in the UK, though it’s found in small numbers in the US from the early twentieth century onward. The name entered the US Top 1000 for boys in 1999, and for girls in 2003. Let’s take a minute and go back to the name’s origins. It’s been a tree name for ages, and that’s a huge category. There’s Laurel and Willow, Hazel and Aspen. Like the surname, the tree’s name comes from the color red, thanks to the color of the berries. Though the tree name is whispered down the alley from Old Norse to English and Scottish before transforming into the same spelling as the surname. It’s presently among the most popular of nature names for boys. The trees were considered quite powerful. The wood fends off witches and vampires, protects ships and cattle and houses. Their berries could help tell the future. When Anne Rice named the supernatural powerhouse at the heart of 1990’s The Witching Hour, she chose Rowan for the most talented of the Mayfair witches. That almost certainly helped raise interest in the name for girls. It rises steadily for our daughters as well as our sons in 1990s, when Rice’s 1990 novel about New Orleans witches topped the bestseller charts. The name has continued to gain for girls and boys alike. One tipping point on the girls’ side: Brooke Shields and husband Chris Henchy welcomed daughter Rowan Francis in May 2003. That year, the name debuted in the girls’ Top 1000. It has gained in use for five years straight for both genders. As of 2016, over 1300 girls, and nearly 2200 boys received the name. That makes it #182 for boys, and #239 for girls. In other words, I’d call this name truly unisex. It fits with so many two-syllable, ends-in-n favorites for our sons, but it also works well with nature names and color names we favor for our daughters. What do you think of Rowan? Do you like it better for a son or a daughter? First published on February 2, 2010, this post was revised substantially and re-posted on July 16, 2014, and again on March 22, 2018. My little 6 year old daughter is Rowan. I’d only met one other woman with the name and it struck me as an interesting, uncommon and strong name. I chose it mainly because of the nature/mythical connotations. My daughter is a little unconvinced since watching a Mr Bean movie . I’m hoping that she enjoys it more as she grows up. She’s a fiery, feisty handful so the name suits her very well. She gets called Ro and Rowie for short. I went to school with a female Rowan; in Scotland the first syllable is pronounced to rhyme with ‘how’ rather than ‘owe’, which I prefer (there’s a folk ballad ‘O Rowan Tree’ too, which is definitely ROW-an not ROWE-an). I like it a lot for both boys and girls, but wouldn’t use it because I don’t think I’d be able to insist on my preferred pronunciation outside of Scotland. My daughter’s name is Rowan, and we get so many compliments on it! I found the name thanks to Brooke Shields naming her daughter Rowan. My daughter’s name is Rowan, and she’s 4. She hates people calling her Rowan and insists on Rosie because someone told her ‘Rowan is a boys name’. It’s sad because I much prefer Rowan. I have to admit we did get some disparaging looks from relatives who have an ‘Owen’, but that’s their problem. Rowan is a beautiful name for a girl. My son is Alexander, and until he was 5, he answered mostly to Aly. Then one of his kindergarten classmates told him Aly was a girl’s name and now he insists on being called Alex. The kicker? Aly was informed about his “girl name” by a boy named Delaney. Rowan rocks. Here’s hoping she reclaims it eventually. Well, I love Rowan for boys, and I can try to be objective and see that it makes a nice name for girls too, but I admit Rowan on girls does bother me–it was my top boy choice for years (even my husband was on board with it–a rare feat!) but then it seemed to be crossing over and we didn’t feel we could use it for our son. I blame Brooke Shields and Anne Rice for sure! If I could be convinced it would remain well used for both sexes (like Morgan, Taylor, etc.) then we still may have used it for our son, but because of the way these things tend to go once they get picked up by girls, we did not feel confident about it. The fact that it is now essentially unisex in usage also made it feel more modern to me than it used to, which I did not like. We love the name we did choose, but I’m still mourning Rowan a bit too, as you can tell…. I loved reading your reply…I named my son Rowan and I just love it, but do have serious doubts due to the fact that it is considered a girls name by so many. Reading your post makes me feel better about my choice, because it is truly is a great name for a strong boy. I liked the name owen and the name ronin, my husband like Rowan so it was an easy pic. 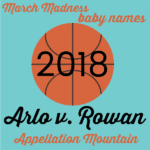 My daughter’s name is Rowan, and i have received many compliments on the name and have known two ladies to name their daughters the same after i introduced them. Well, I like Rowan on a girl for it’s my name. It’s quite rare and that’s what I love about it. When I was younger I didn’t like it, but I’ve learned to see the beauty in it. It’s strength! I love Rowan for a boy, I also really like Rohan, but like Rowan more for its tree associations. I must admit, that I do kinda like Rowan on a girl as well. Love on a boy. Like on a girl. Reasons for use on both, although on a girl, I tend to think of the 70’s horror, The Wicker Man. I have yet to run across a Kiwi female Rowan (that I can recall) but I’m sure it will happen. Peoples’ first associations tend to be more often than not, Mr Bean/Blackadder aka Rowan Atkinson. It was also the name of my first guy I really liked in high school so there’s a sentimental quality there too. I like Rohan more so I used that instead. Just a thought, but the boys’ sound-alike Owen took off in the 90s (going from a rank in the 200s to solidly top 100). Perhaps parents were looking at -owen sounding names and found Rowan? And the Sherlock Holmes deerstalker goes to JNE. I’ll bet you’re right about Owen/Rowan! Brooke picked the middle name/spelling after her grandfather, who she was close to and I think I read that he died right before Rowan was born. This is interesting. I always thought that Rowan was a girl’s name. Then on Y!A all the “experts” maintain that it’s a boy’s name that’s crossing over. So I believed that. But I still think it’s a great romantic name for a girl. I’m happy to have read this post and see that it goes either way. However, I’d love to know why Brooke Sheilds’s daughter’s middle name is spelled with an I instead of an E. Were they actually hoping for a boy? To be honest, I think “crossing over” is something of a myth. It’s just not all that clear that once a name is adopted for girls, it goes out of use for boys. But more on that in a future post. And yeah, I do find the Francis spelling odd … not sure if she’s ever explained it. I love the combo, but I wish Francis was spelled with an e.
In 1980 my Mum almost called me Rowan. I think she was attracted to the botanical aspect of the name for girls. I’m really glad she didn’t pick Rowan, as our last name was Atkinson – so that would have been awkward when the male Rowan Atkinson became so famous. I knew a Rowena when I was about 8 and I preferred that name, as it sounded more girly. And then I went on to name my daughter Rose, so I prefer that Ro- name for girls. And maybe Ronan for a boy. I do prefer Rowan for a girl over Madison and Taylor etc. Though in general I prefer a name where the gender of the person is immediately clear. […] Rowan – Katniss is a nature name, and many of these are also borrowed from the natural world. […] Gender neutral name most likely to stay gender neutral … Rowan.